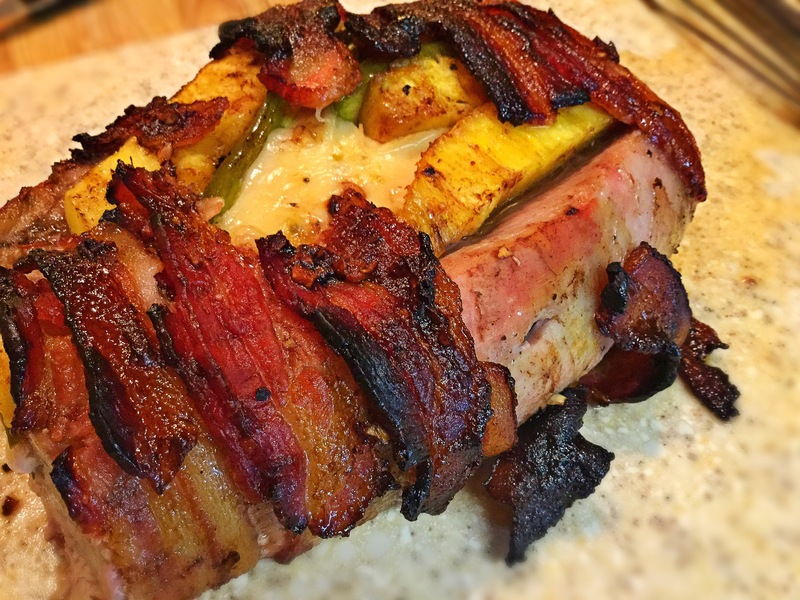 As of late, there has been a cooking phenomenon of baking the King’s Hawaiian rolls with ham and cheese, roast beef and cheese, turkey and cheese, do I need to go on? ..and quite frankly, I LOVE it! I have tried them all and they are all delightful. On that same note, stay with me…my oldest son has been on a Lilo & Stitch movie binge. Every single night before bed, for the last 2 weeks, he requests this now somewhat old movie, at least compared to his 6-year-old self. Fifteen days into it later, he randomly asked me if I could make “Hawaiian Sandwiches” for dinner. Now, I wasn’t about to go buy a can of SPAM, so I got creative while thinking of those new, beloved baked sandwich recipes. Below I give you another favorite that needs to be added to the Pinterest lineup of such. You can make them for an appetizer, party, a dinner with a side of fries… A super easy and fun recipe to enjoy with your whole family! 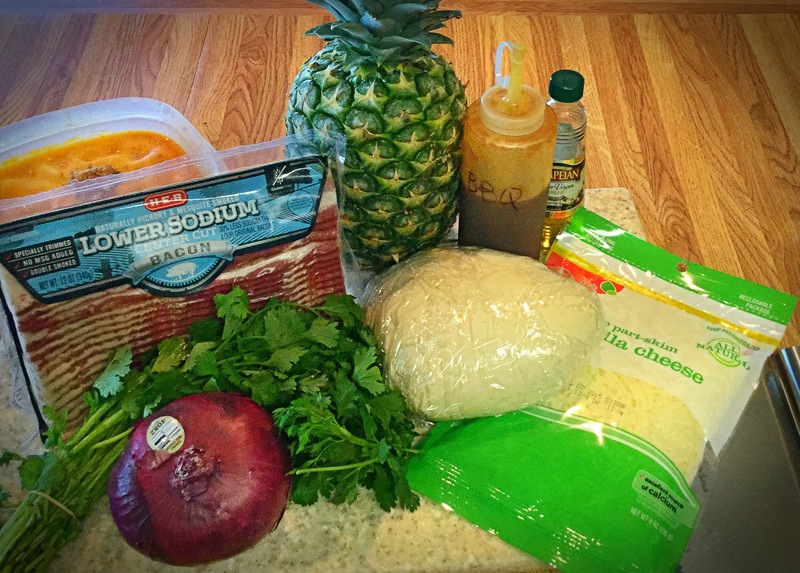 *You can use fresh pineapple, by all means, but for this I actually prefer the canned variety, as fresh is pretty tart and overpowering for this recipe. That being said, my preferred brand is the new’er Libby’s Brand “Skinny” Pineapple…It is not canned in that heavy syrup, so it’s not cloyingly sweet. Preheat the oven to 350 degrees and lightly grease or non-stick spray a rimmed baking sheet or casserole dish. Most recently, I used my Pyrex 8×11, but I have used a foil-lined & sprayed baking sheet when I made a double batch. In medium microwave safe bowl, slowly melt your butter. Whisk in the soy sauce, ground ginger, garlic powder and coconut. Set aside. With a large bread knife, halve the ENTIRE 12 (or 24) rolls horizontally, so that the rolls are still connected to each other and you have two “bread rectangles”; a bottom halve and a top half that will form your sandwich slider. Place the bottom half of bread into your prepared bread and lay on half of the cheese, followed by the ham. 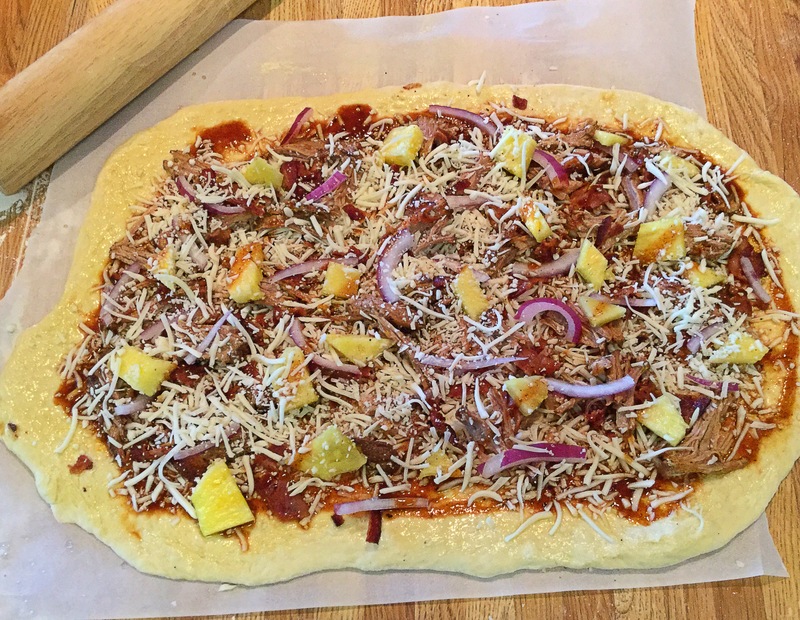 Next drizzle the BBQ sauce evenly overtop, followed by the pineapple and then the remaining cheese. Place the other “bread rectangle” topper on top. 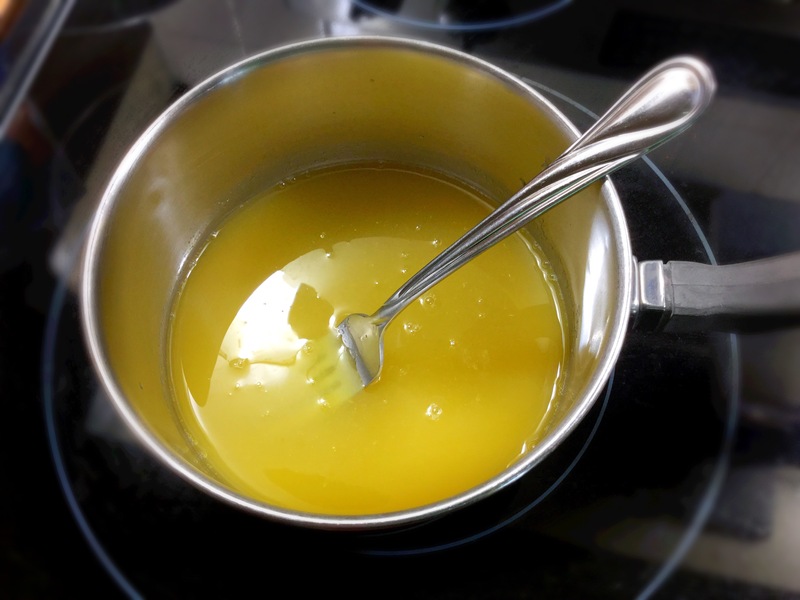 Whisk your butter mixture once more and evenly pour or brush overtop it all (don’t worry, it doesn’t get soggy). **If using the fresh jalapeno slices, I like to place 1 slice ON TOP of each roll (12 slices) and then pour on the butter mixture. Immediately transfer to your preheated oven, uncovered, for about 15 minutes, till the top will be a deep golden brown and the cheese is super melty. I don’t know a soul that doesn’t crave something “tropical” during the summer months. Not one. So one morning, as I was doing just that, I realized I had no rum in the house (plus it was super early..) so I couldn’t whip up a mai-tai or pina coloda..poor me. Instead, I thought I would treat the entire family to a delish breakfast that would transport us to an idyllic island! Now I’m not sure if my kids fell for that part, but I sure imagined me and that mai-tai and they had no problem cleaning their plates! Win! 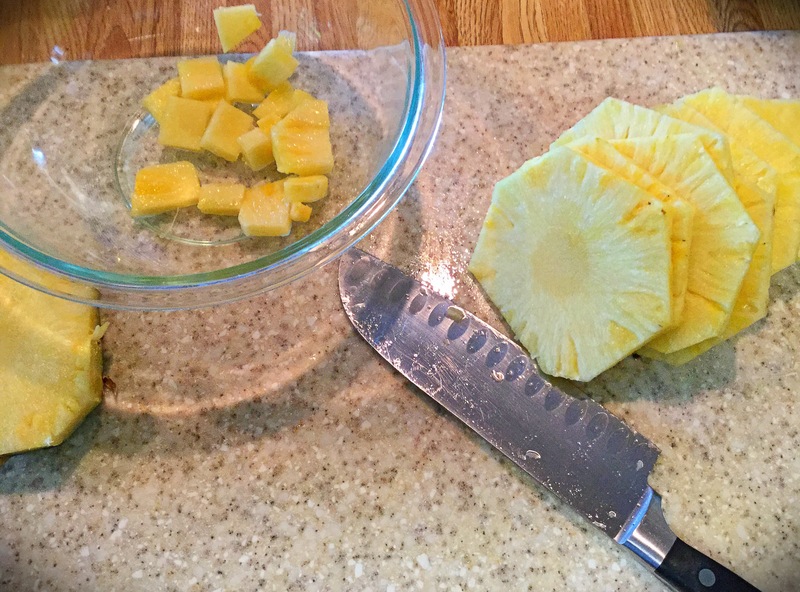 Begin this breakfast delight by starting the Pineapple-Honey Syrup. In a small saucepan, simply combine the pineapple juice and the honey (plus the pineapple chunks if desired) and bring to a low boil while whisking. Once combined turn to low and set aside. Next, start the melting of the tbsp of butter in a small bowl in the microwave, remove and let cool slightly while you mix the dry ingredients. *if the butter is too hot, you’ll end up with scrambled eggs..no good. 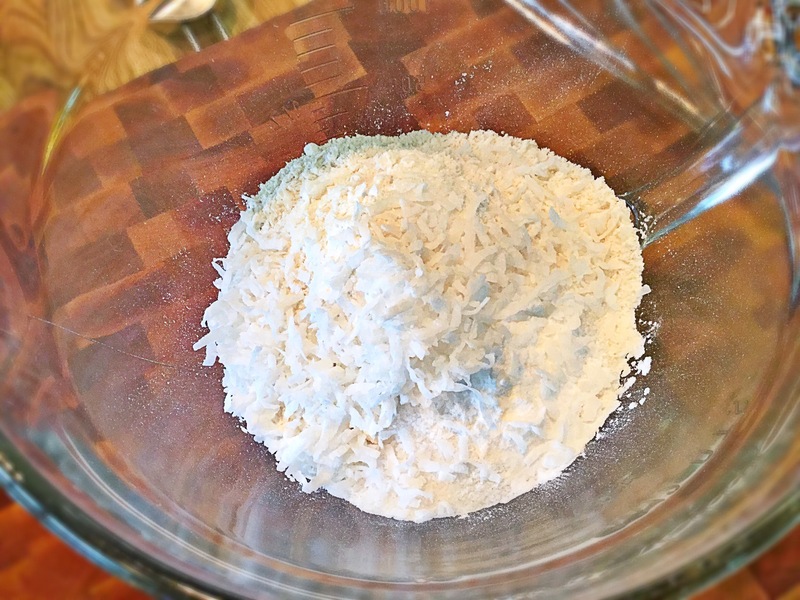 In a large bowl mix together the dry ingredients, including the 1/4 cup sweetened coconut. 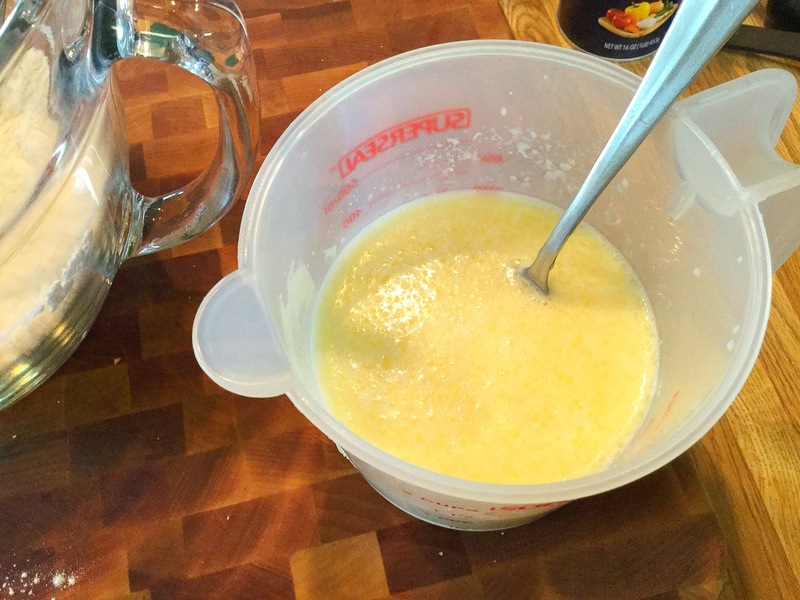 In the small bowl of now cooled melted butter, whisk in the coconut milk, regular milk and egg. Pour the wet ingredients into the dry ingredients and stir till just together. You do not want to overwork, lumps are a-ok!! Finally heat up your pan, skillet, griddle, what-have-you, along with another Tbsp of glorious butter. Ladle about 1/3 cup of batter down and cook each side to your desired golden brown color. Let’s serve these pancakes!! 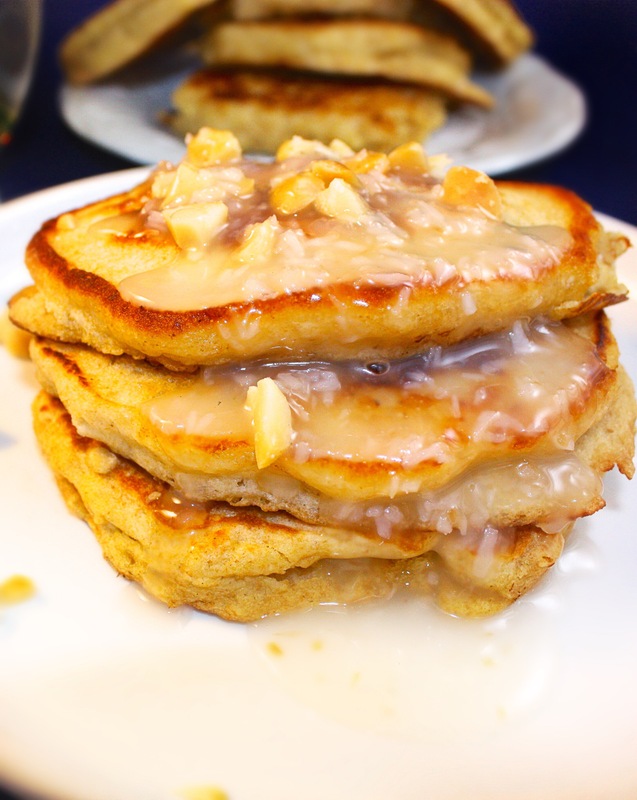 Pour the warm Pineapple-Honey Syrup over each stack and top with your choice of chopped nuts and more coconut!! Enjoy! *Serve alongside some crispy bacon and eggs for a hearty, savory breakfast! 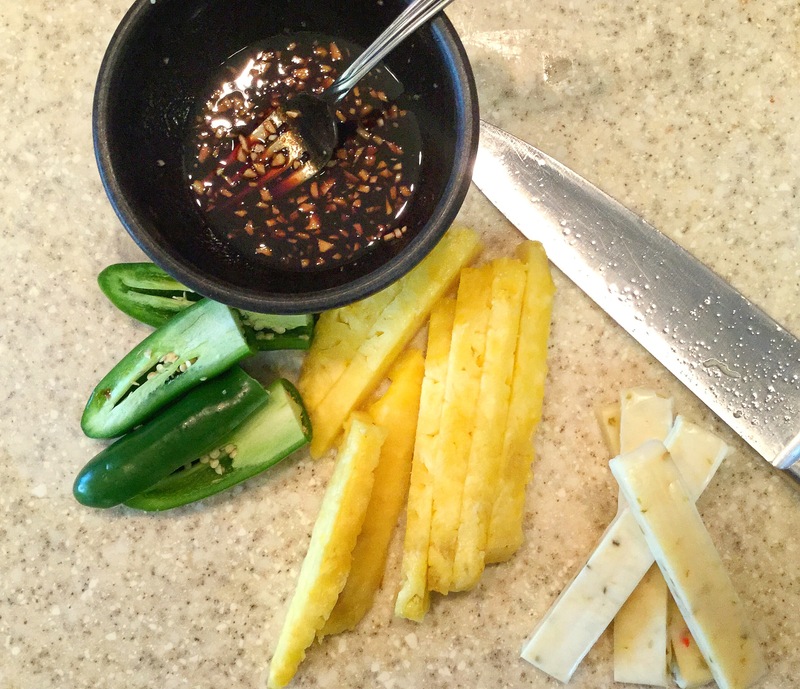 A few months back our family went to a local restaurant here in Texas and my husband had this fun appetizer with ‘sweet-heat’ ingredients. After I helped myself to a sample bite of his meal, I knew I had to recreate and tweak it into dinner form…and I have to say, it’s not too shabby! These flavors together remind me of the Hawaiin rice, veggie and meat bowls I used to get when living along the coast of San Diego. So naturally I paired the main dish with a heaping of rice and drizzled the juices overtop. It’s quite the pairing! Preheat your oven to 375 degrees and line a baking sheet with foil and a rack overtop. In a small bowl whisk the honey, balsamic vinegar, chili sauce, garlic, EVOO and a pinch of salt & pepper together. Set aside. *Taste the glaze to tweak any ingredient to your taste. 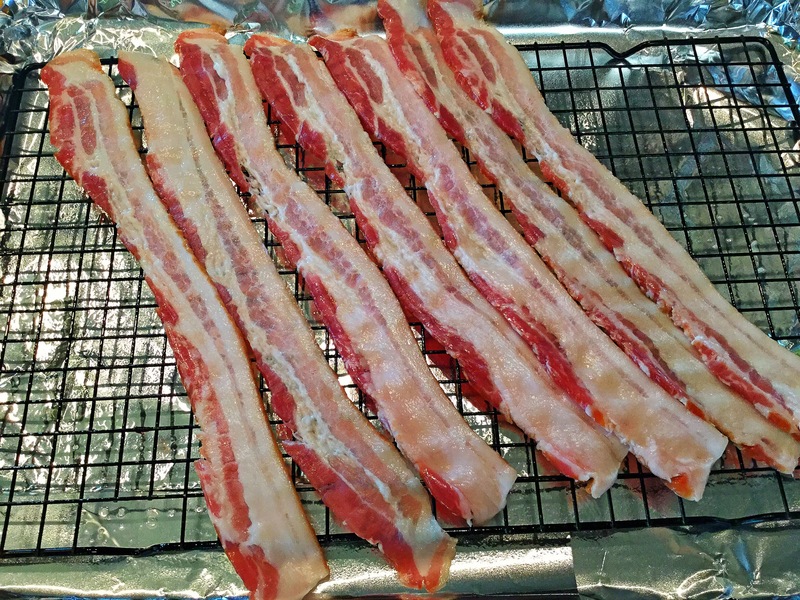 Now lay the bacon stips, touching, on top of the wire racked baking sheet. 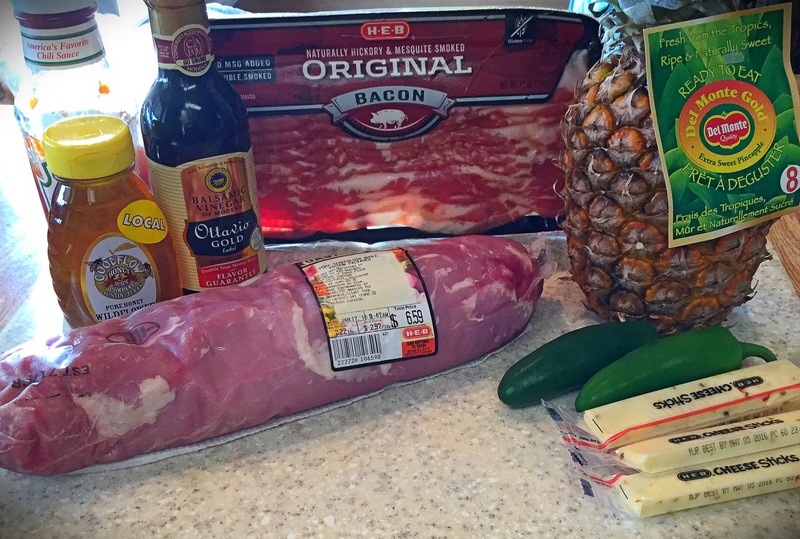 Next, butterfly the pork tenderloin and stuff with the pineapple, jalapeños and cheese. *To make it fit a bit better, I’ll get pepper jack string cheese or cut a block into strips and stuff into the jalapeño before putting into the pork. Shredded cheese could be used as well. Season with another pinch of salt and pepper. Transfer the stuffed pork onto the layed out bacon strips. Coat a good amount (about 1/2) of the prepared glaze allllll over the pork. 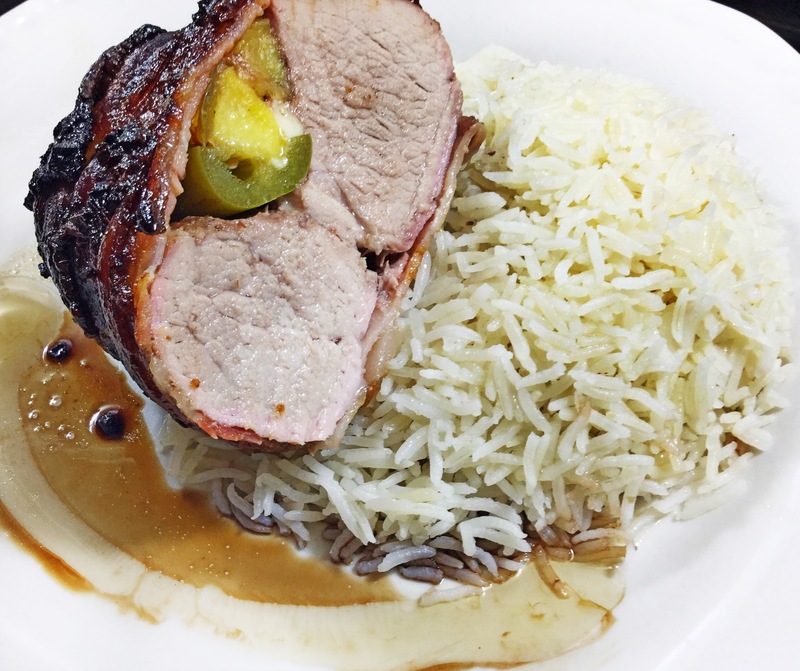 Wrap up the entire stuffed tenderloin with the bacon. *If needed, you can use toothpicks to secure, just remember to remove before eating! 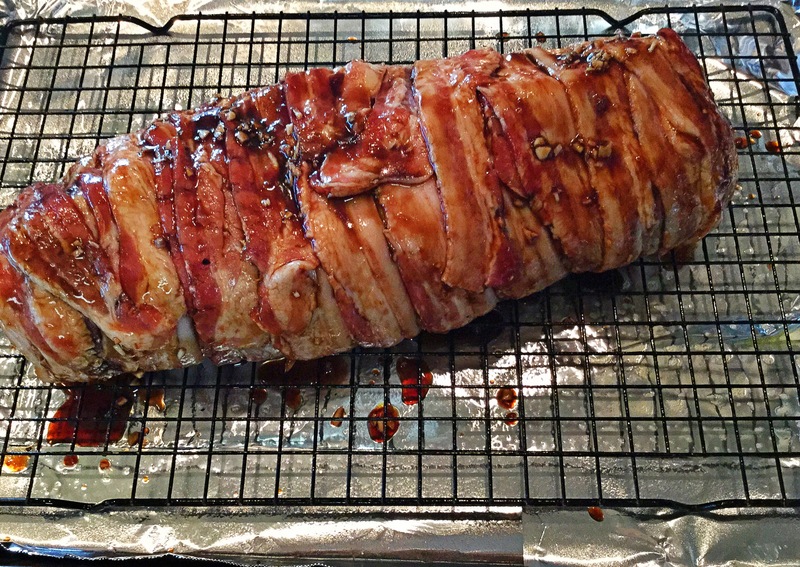 After the pork has been fully wrapped in delicious bacon, coat the entire thing with the rest of the glaze. Place into your oven, uncovered for 45-60 minutes (meat temperature at least 145degrees and bacon done. *About halfway through check on the bacon. Depending you may need to lightly tent the wrapped tenderloin with foil. Though we like ours more on the crisp side. To each their own! Remove the cooked tenderloin from the oven, lightly tent with foil, and let rest for about 5 minutes. 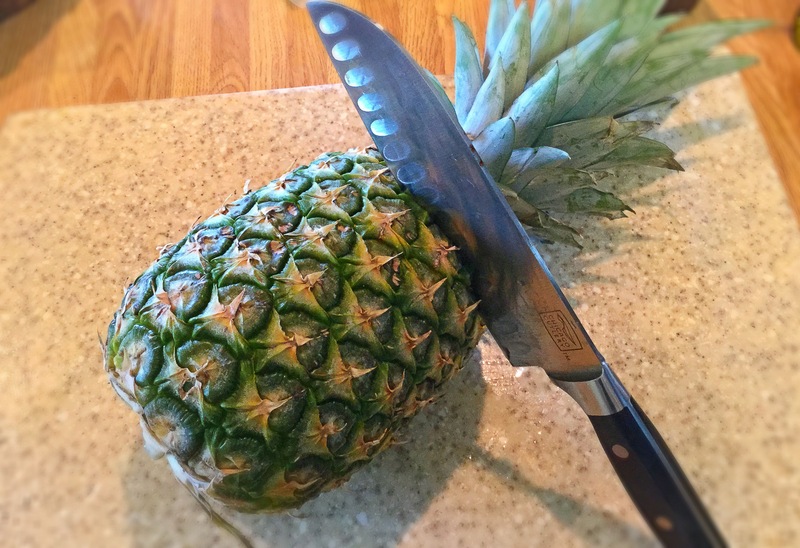 Carve into 1-2″ slices and serve over rice. Spoon any drippings over the pork and rice. Enjoy!! Leftovers. Yep, this insanely good pizza idea came from a remaining beer braised pork I made the other night. 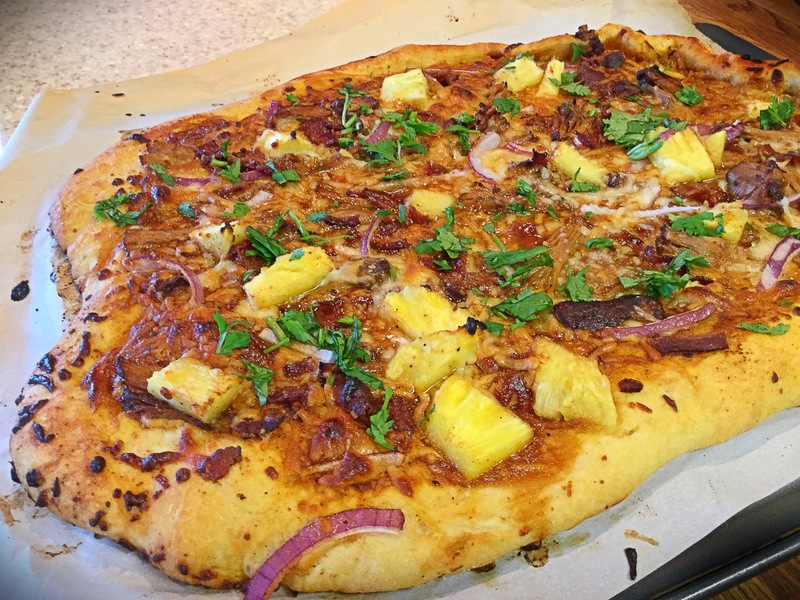 My family, of course, loves pizza in any flavor so with what I already had on hand and a quick trip to the market for a fresh pineapple, dinner was good to go!! Your average commercial ‘Hawaiin Pizza’ consists of ham/pineapple and marinara..but let’s change it up and make it BETTER! Now I can’t say that in Hawaii they’re huge on southern BBQ but I know they’re big on pork! This shredded pork is THE way to go. …However, I’ll give you credit if you use chicken or cut up ham, I mean you just can’t mess this up! 1 cup BBQ sauce (I prefer thinner, ‘Texas Style’ Franklin Barbeque), plus more for a drizzle garnish. Whether you bought dough from your local pizzeria, made your own in advance or even bought a Boboli premade crust..this WILL be good! 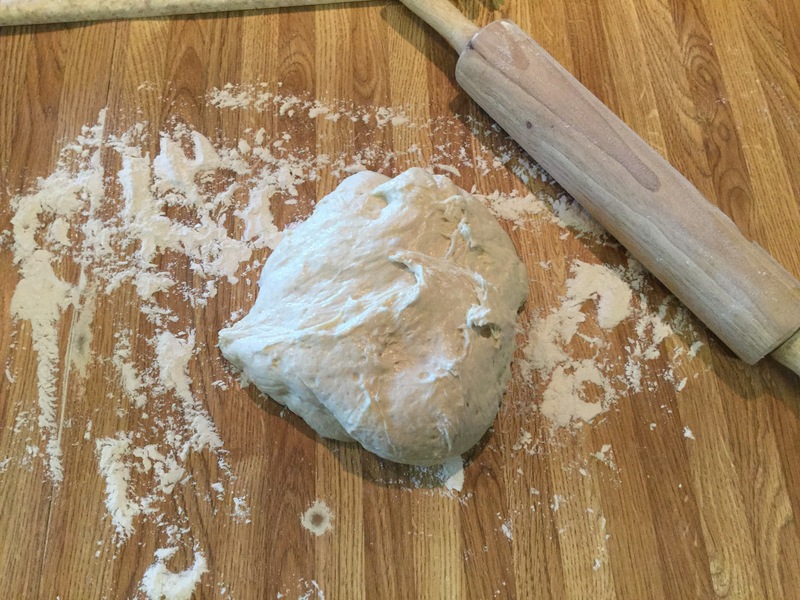 So now that the dough is in some form ‘ready’, let us prep the rest of our ingredients! *One more assumption of mine, as you read above I am using some of my leftover Beer Braised Pork. If you did not make that recipe or have any leftovers, here is where you will season and cook or grill your chicken. Precooked and self-cubed ham would be fine too. The bacon!!! 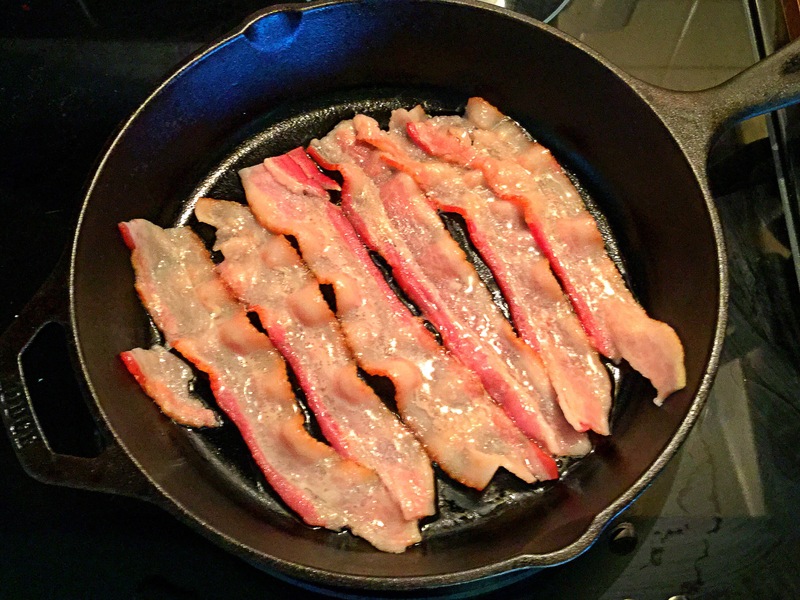 In a skillet, cook the always delicious bacon to your desired doneness..whether that be chewy or crispy. I’m a crispy gal, but to each their own. As that bacon is frying away, let’s cut the onion. This gives the pizza a nice bite, BUT since I don’t want the onion too overpowering, we soak! 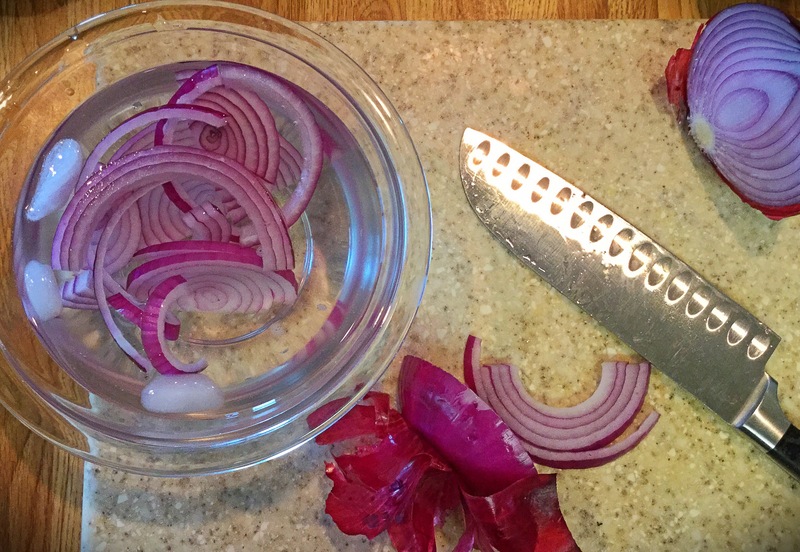 Yep, after you thinly slice the purplish-red veggie, place the slices into a cool ice bath of water. This will take the harshness out of the onion..also a great trick for sandwich making. 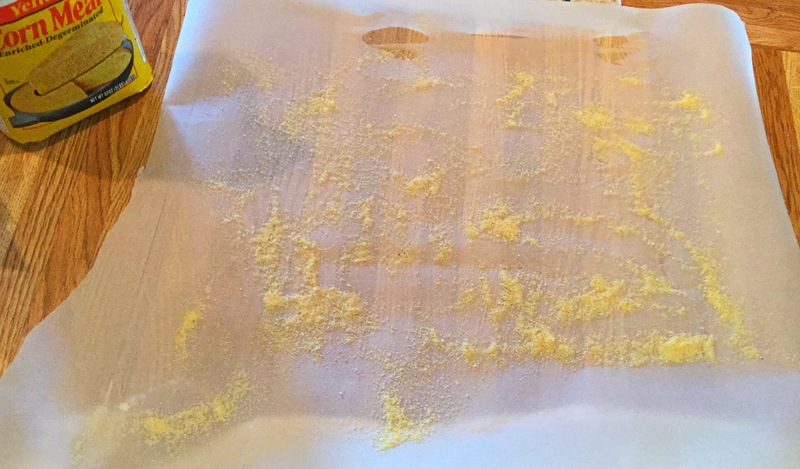 When ready to assemble, just pat dry with a paper towel. Well, that’s about it! Your main toppings are done! 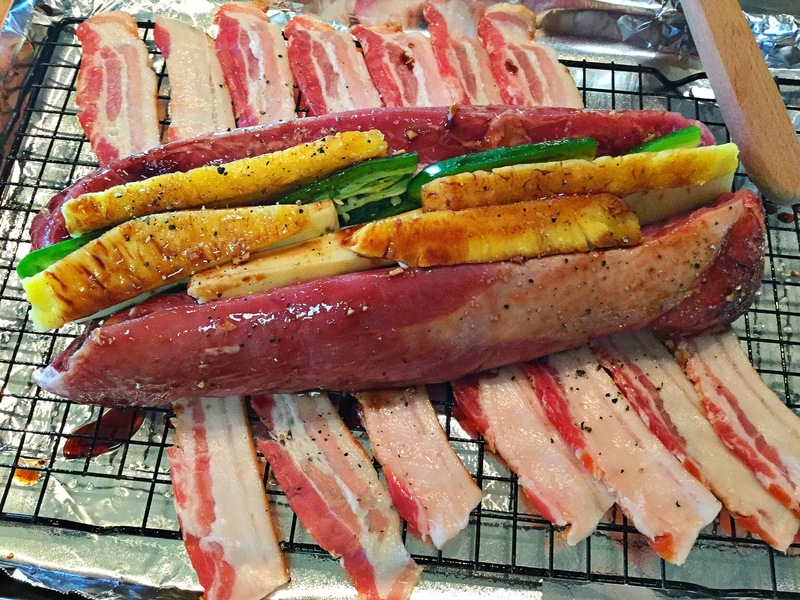 Veggies and fruit cut, meat/poultry cooked and bacon is done and crumbled….assembly time! Preheat your oven to 400 degrees or to your dough’s package instructions. 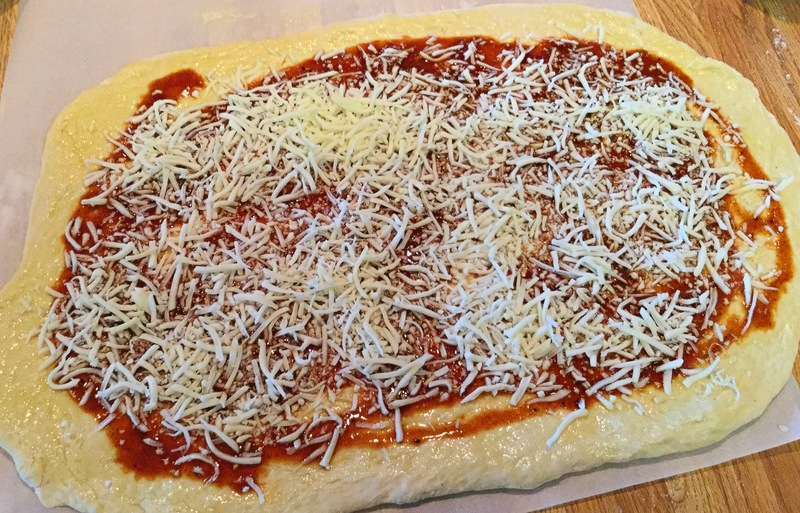 While preheating, place your pizza stone OR a baking sheet in oven to warm as well. If needed, roll out your dough..I like a bit of cornmeal under my crust for added texture. Also, do a Tbsp layer of EVOO over the top of your crust. Next, ladle a nice amount of your preferred bbq sauce and about 3/4th of your cheese. I then add the shredded pork, bacon, red onions and pineapple down..followed by the remaining grated cheese. 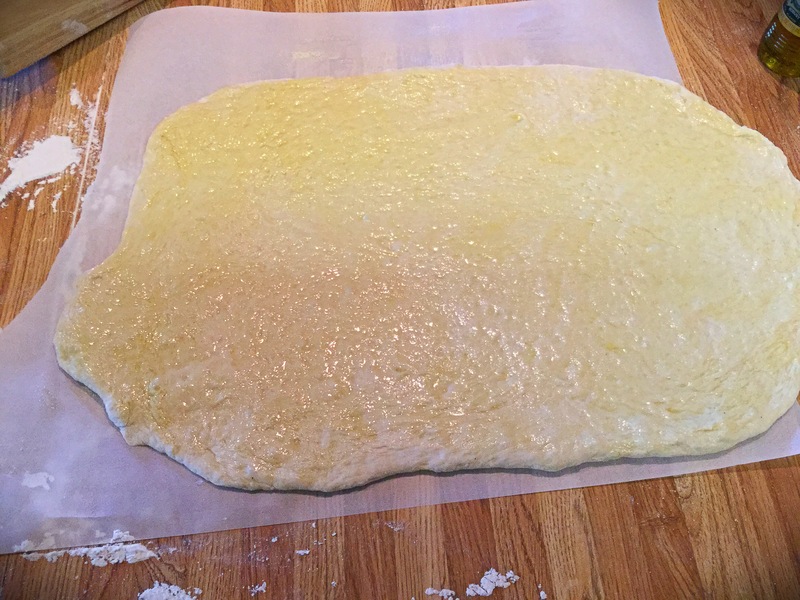 Place your dough on a pizza stone (or your dough with parchment paper under it, on an UPSIDE-DOWN, large baking sheet). Cook in your 400 degree oven for about 20 minutes or according to your premade dough directions. Garnish with some freshly chopped cilantro, an extra drizzle of BBQ sauce and perhaps some thinly sliced jalapeños. Enjoy!! Life in the south is wonderful. The greenery, the big trees, real southern hospitality and the best part…the food!! I tend to make lots of yummy comforting meals, but I thought I should try my hand at some of their sweets. What better to start with than the legendary Hummingbird Cake. Now I don’t know the origin of its name, but I do find it pretty..and this cake is so dang good that I really don’t care. The bananas keep it moist, the pineapples give a nice tartness to the sweet aspects and the pecans give that great crunch! Preheat your oven to 350 degrees. Butter and flour or non-stick spray 2 round cake pans. In a large bowl, combine the flour, sugar, baking soda, cinnamon and salt. Sift together till evenly dispersed. 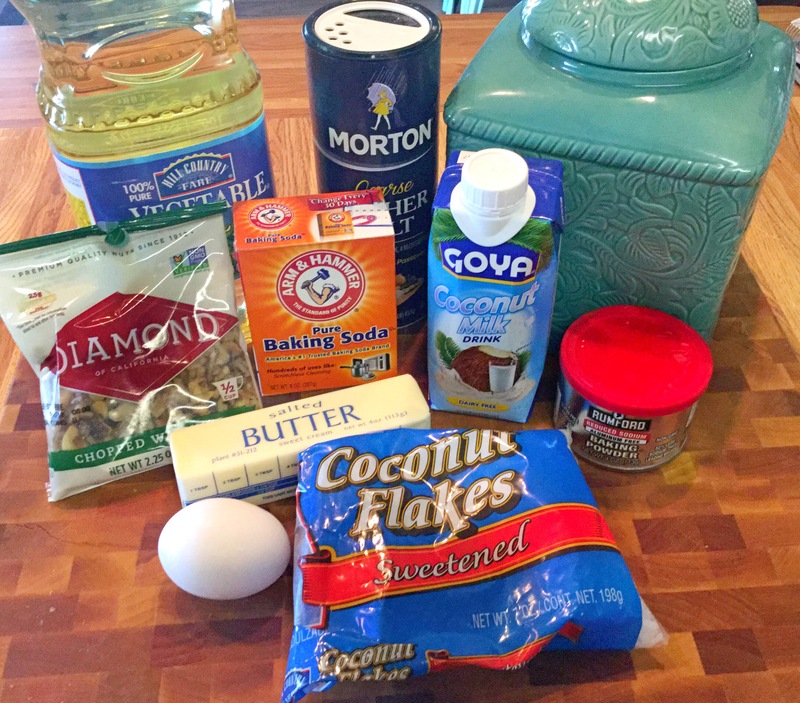 Next, add in your eggs, oil, vanilla extract and mix together with the dry ingredients. Make sure your pecans are roughly chopped and add those in the batter along with your crushed pineapple & bananas. Gently fold in the fruit and pecans into the batter. Honestly, you could probably still use your stand mixer. Just do so on low till ingredients are incorporated. Don’t worry about the bananas mushing up, that’s a good thing that will keep your cake moist! Spoon this delish batter evenly into each cake pan. 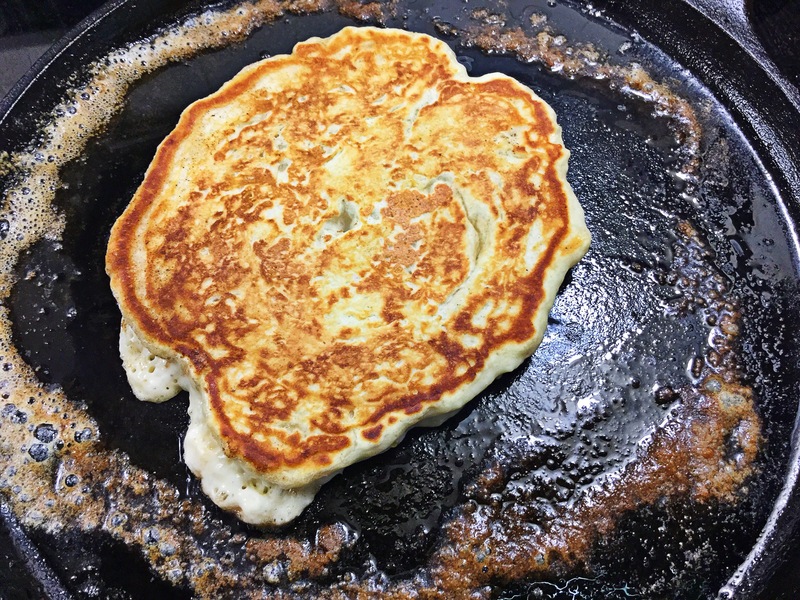 If needed, shake pans side to side slightly to even out the batter. Place into oven and bake for 28-30 minutes, toothpick comes out clean. Remove from oven and allow the cakes to remain in pans for about 5 minutes. Transfer the cakes out of their pans and onto a cooling rack. You definitely want your cakes cool to the touch before applying the frosting. To assemble, spread half of the frosting onto one cake round. Very carefully place the other round onto the bottom frosted cake and liberally frost that top. Though optional, I like to garnish the cake with a bit of toasted coconut and a pretty Spring colored flower. I also like to dust the sides of cake with some powdered sugar for a rustic look. Feel free to frost the entire cake if that’s your desired look!